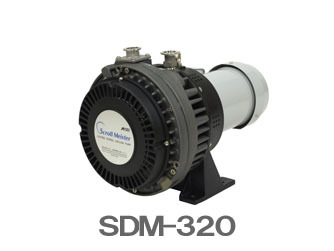 These dry vacuum pumps operate with less vibration, less noise and a longer maintenance cycle than the ISP Series. The lineup supports a pumping speed of 320 L/min. Analyzers, accelerators, radiation facilities, etc. The low-vibration, low-noise oil-free scroll vacuum pump has been improved to operate with even less vibration and noise. The impact on the analyzer can be minimized.